Pioneers in the industry, we offer meat slicer, wet masala grinder, pulverizer, vegetable processor, dough kneader and meat mincer from India. Blade Size 195 mm 8"
Owing to our sound infrastructure unit, we have been able to manufacture, trade, and supply Wet Masala Grinder. 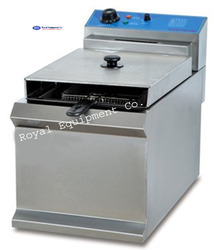 This grinder is processed by utilizing best quality factor inputs and new technology. 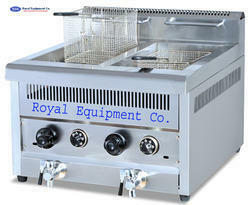 Our presented grinder is enormously commended and valued by our consumers. In addition, our quality experts examine the given grinder at different parameters to assure a default free range. 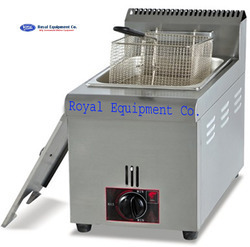 Royal Kitchen Equipment Co. are leading Manufacturer, Supplier, Exporter, Importer and Wholesaler of customised wide range of Pulverizer for wet and spice. These pulverizers are processed according to the market norms. Apart from this, our experts examine the offered pulverizers at different factors of quality in order to make certain a perfect range at the customer’s end. 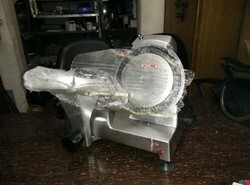 These pulverizers are usually commended among our customer’s because of their attributes. 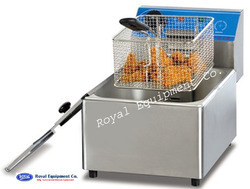 Royal Kitchen Equipment Co. are leading Manufacturer, Supplier, Exporter, Importer and Wholesaler of customised Kitchen and food equipment. 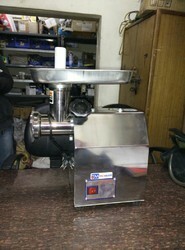 We also Justifying our status in the domestic market, we are involved in offering an extensive gamut of Meat Mincer to our customers. 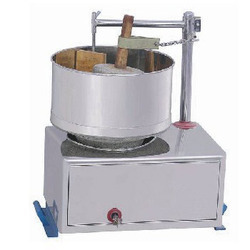 Used extensively for the mincing of meat, these provided products are highly acknowledged. Furthermore, we make sure that supreme quality material is used by us in their manufacturing process. Along with this, we provide customization facility for the comprehensive collection to our patrons. 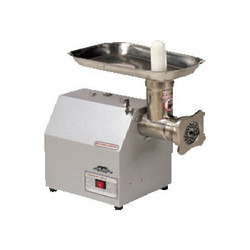 We offer to our client superior quality of Meat Mincer. 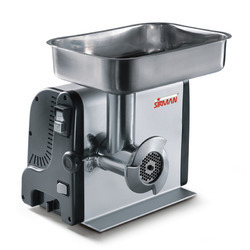 A meat grinder or meat mincer is a kitchen appliance for fine chopping ('mincing') of, or mixing of raw or cooked meat, fish, vegetables or similar food. 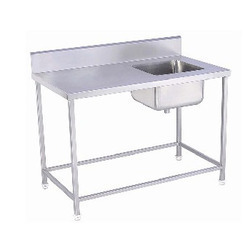 It replaces tools like the mincing knife, for example, which has been used to produce minced meat, filling etc. 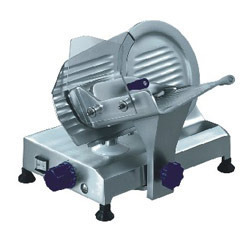 Easily and smoothly operated, the mincer is a corrosion resistant product constructed in sturdy manner. Our product range includes Poultry Processing Machine, Chicken Processing Machine, Poultry Processing Equipments, Poultry Processing Plant, Chicken Processing Plants, Chicken Meat Processing Machine, Chicken Meat Processing Equipments, Chicken Meat Processing Plants, Poultry Slaughtering Machine, Chicken Slaughtering Machine, Poultry/Chicken Cutting Machine, Poultry/Chicken Equipments, Poultry/Chicken Plants, Poultry Chicken Dressing Machine, Equipments & Plants. •Compartment for knives and plates.